Haute-Isle has been settled since prehistoric times, and until the 1800s almost all of its inhabitants lived underground. 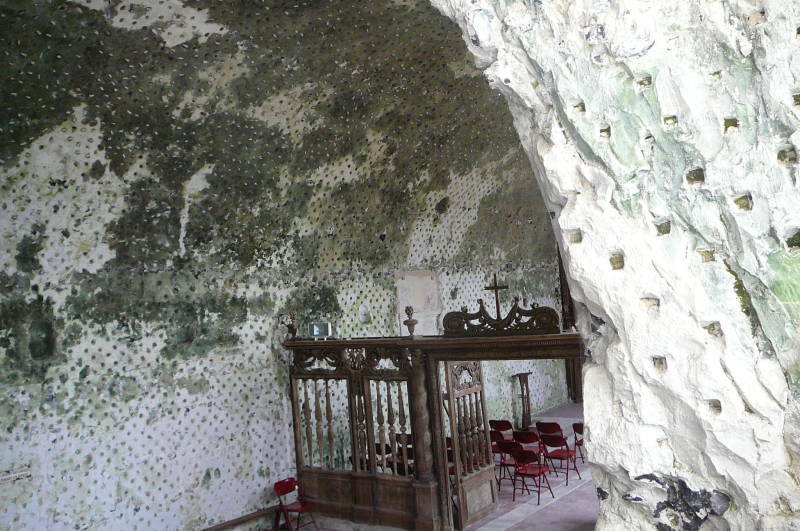 Their homes were carved into the chalk bluffs lining the right bank of the Seine between Vétheuil and Vernon. 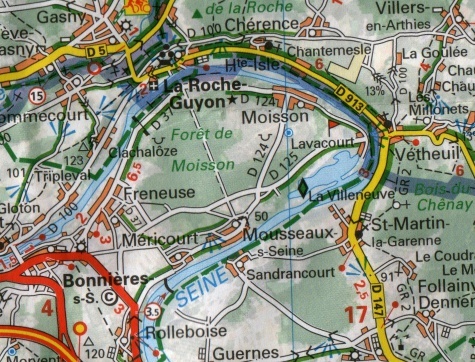 The Seine has cut into the Vexin plateau over the millennia, resulting in bluffs along the outsides of the river's large loops. The homes, in excavations the locals call boves, were arrayed like boxes of a theatre looking out over the river from the bluffs. 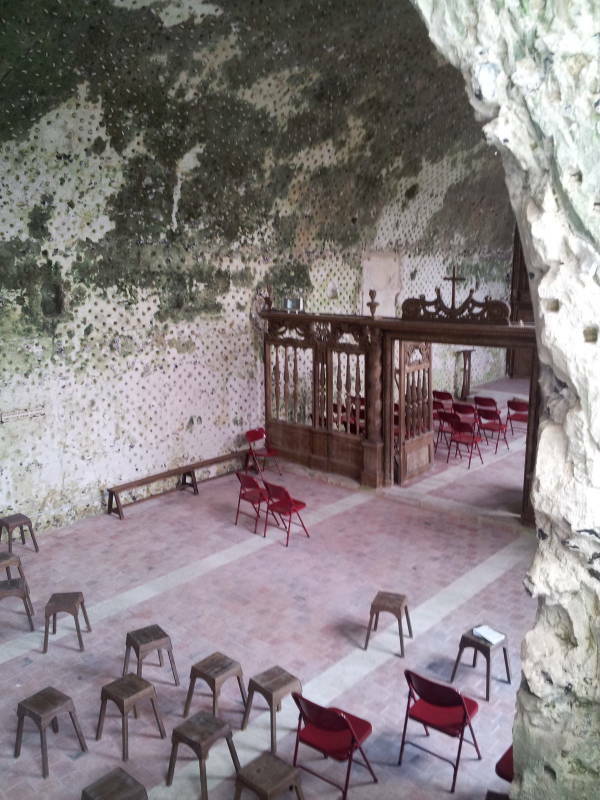 The underground church in Haute-Isle is one of just five in all of France, and the only one in the Île-de-France region. The village of Haute-Isle is on the D 913 road (formerly designated 313) between Vétheuil and La Roche-Guyon. 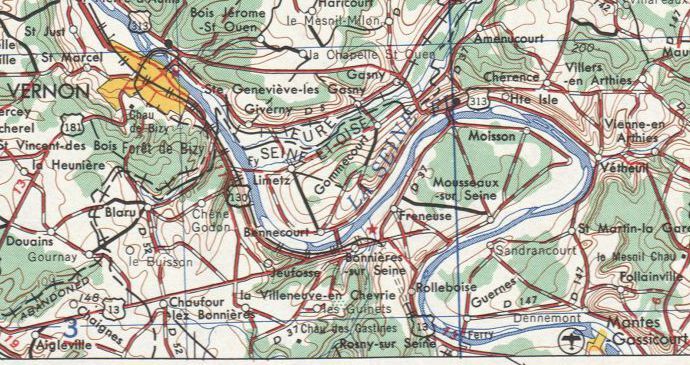 This map from the Perry-Castañeda Map Collection at the University of Texas at Austin uses data from 1951-1953, when there was a mostly destroyed bridge at La Roche-Guyon and the highway along the Seine was still #313. The one below is more recent. The village was part of the parish of Chérence until 1670. In that year, Nicolas Dongois, the chief clerk of the Parliament of Paris and a man with some family connections, petitioned for it to be elevated to the status of an independent parish with, of course, himself in charge. If you're going to be the lord of a parish, you need to have a parish church. So, Nicolas Dongois would be expected to build one. 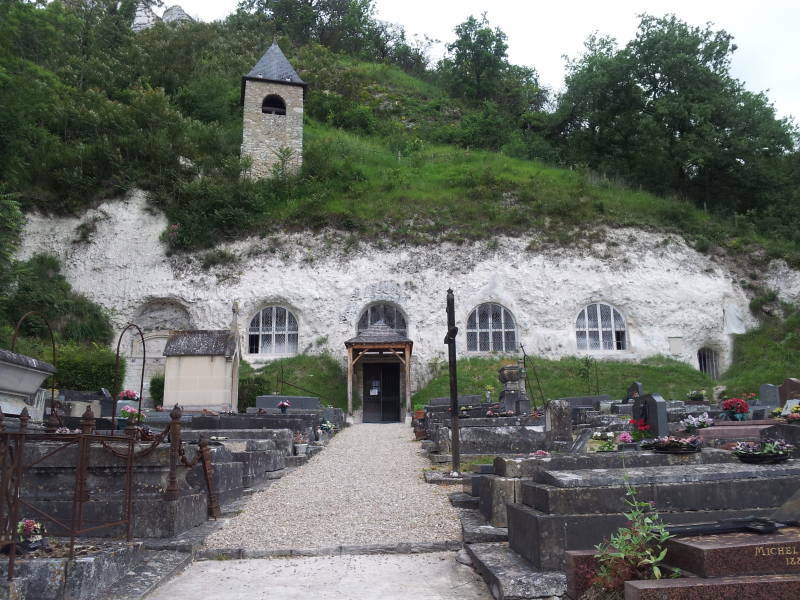 Instead he excavated one, the Église Troglodytic de l'Annonciation de Haute-Isle, or the Haute-Isle Underground Church of the Annunciation. It was constructed throughout 1670-1673. Only its steeple, entrance, and windows are exposed. 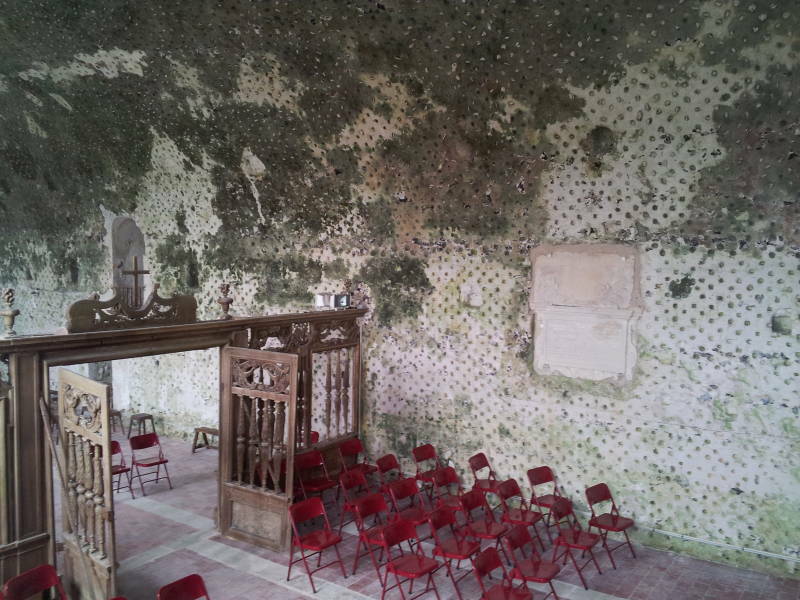 A similar church nearby in Mousseaux-sur-Seine was destroyed in 1749, leaving this the only underground church in the central Île-de-France region. 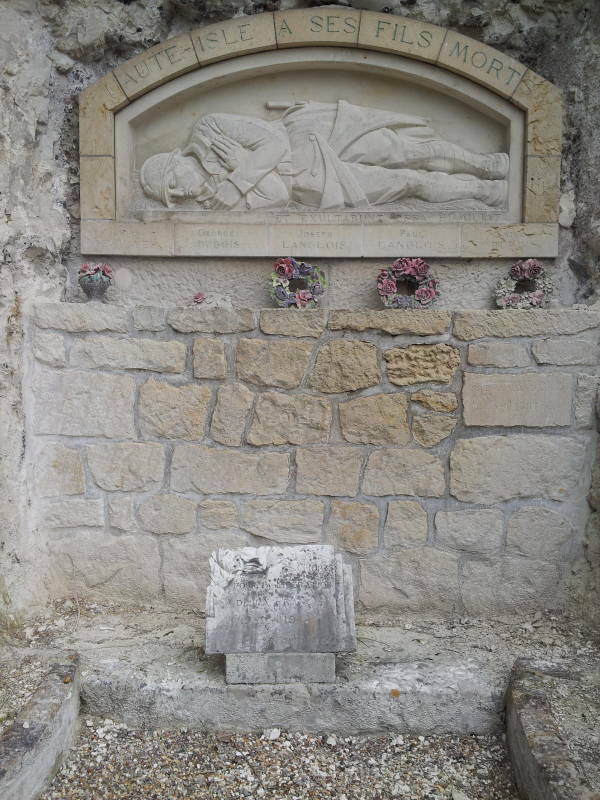 Like everywhere else in France, the church has a memorial to the many local men killed during World War One. The church doesn't have a façade in the classic sense. The bell tower rises out of the grass-covered soil leading up the steep slope to the Vexin plateau above. There is a small amount of masonry around the windows in the upper half or third of the right or south wall of the church. 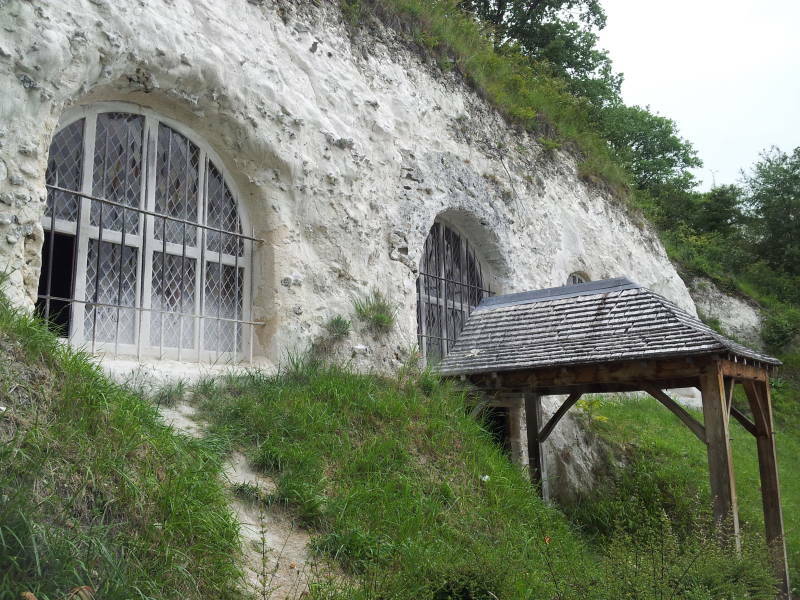 The half-cylindrical "roof" span, its plain left or north wall, its floor, and the rear wall and its apse end are carved into the chalky bluff like the small boves occupied by the inhabitants at the time. Most churches are entered via doors in their rear façade, at the rear of the nave. The wall at the rear of the nave of this church is simply the vertical wall where the excavation ended within the hillside. The entrance here is high on the right wall, below the central window. Opposite that, a doorway leads into a cylindrical staircase, carved out of the solid rock and leading up to the bell tower. The main body of the church is 20 meters long with a simple cylindrical arched ceiling 8 meters high. A wooden screen divides it into a nave and choir. 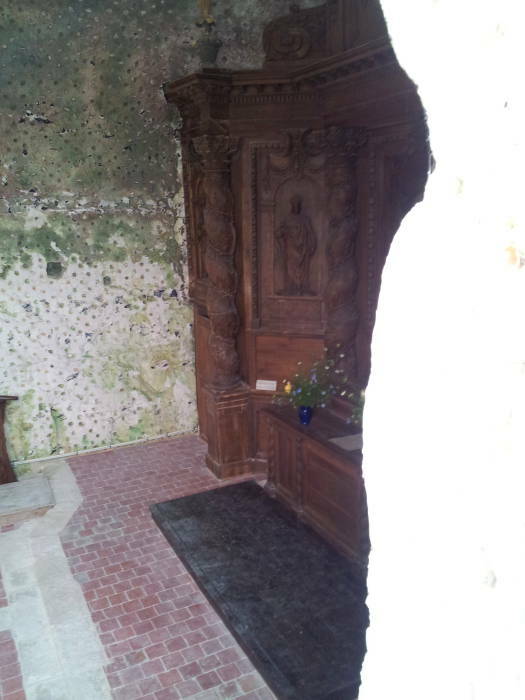 The altarpiece was carved from wood in the 17th century. The village was focused on wine making until the early 1900s. People started building more conventional homes, until today the boves are used for storage and as garages. 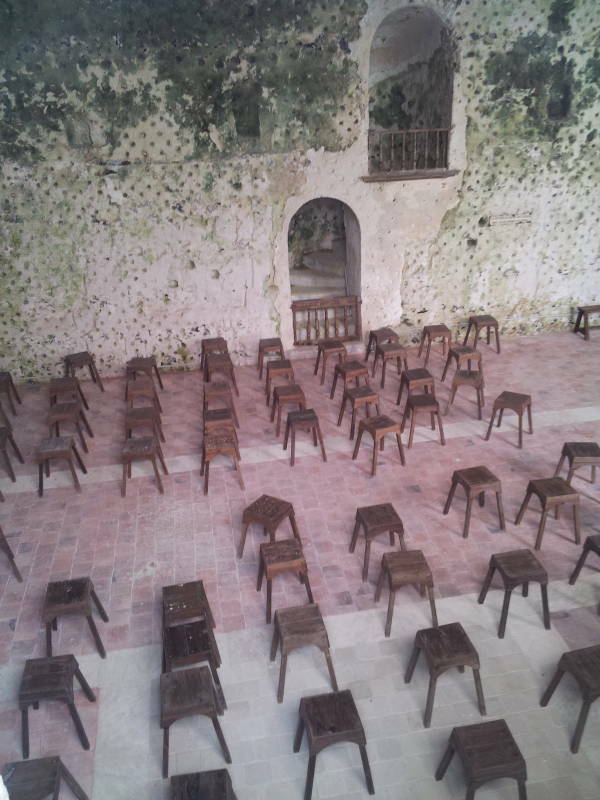 The church was closed in 1999 because of a fear of landslides. 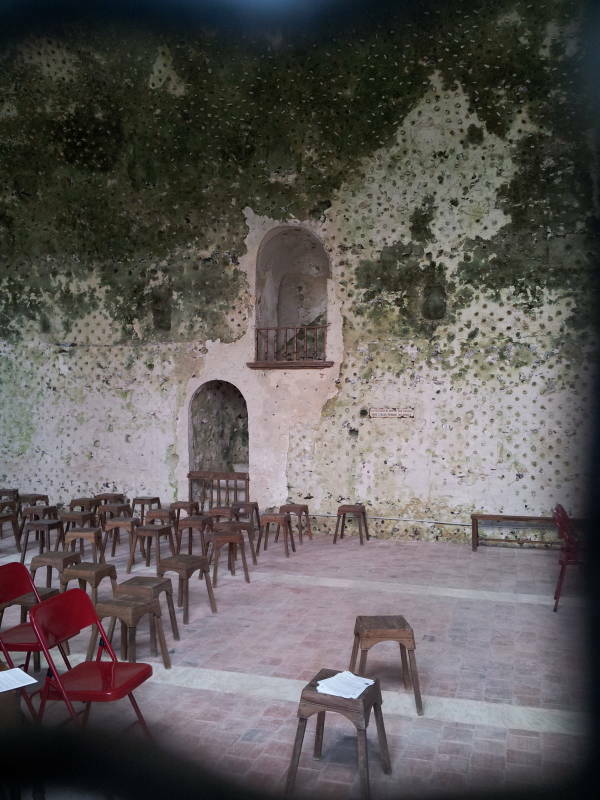 Restoration has allowed it to re-open and it again functions as the parish church.